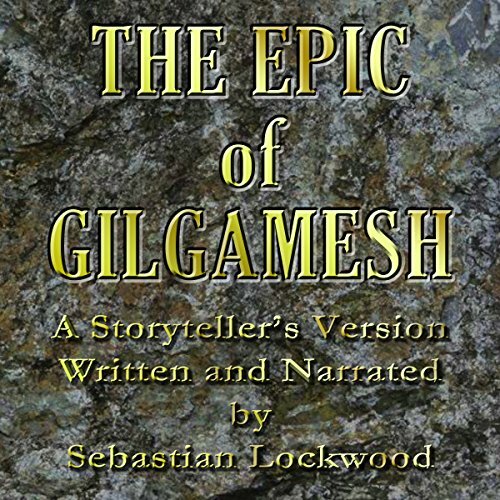 A new version of The Epic of Gilgamesh by Sebastian Lockwood. This is the story of Gilgamesh, King of Kings, who brought back knowledge from before the flood - who loved and lost his companion Enkidu and had to find out why we die. The Epic of Gilgamesh was written on clay tablets over 4,000 years ago, in what is today Baghdad Iraq - the Biblical Garden of Eden between the Tigris and the Euphrates. Having performed the story for years, Lockwood gives a passionate reading from a text that faithfully follows the original. Would you try another book from Sebastian Lockwood (adaptation) and/or Sebastian Lockwood? If you can imagine a British Shakespearean actor reading The Epic of Gilgamesh as Captain James T. Kirk might read it... then I highly recommend this audio book for you. The story itself and its ancient history. What didn’t you like about Sebastian Lockwood’s performance? His read; an overly dramatic start and stop performance that honestly does sound like William Shatner when he portrayed Captain Kirk on Star Trek. What character would you cut from The Epic of Gilgamesh? You can not cut a character from this story - this story is thousands of years old - adding text to the story it bad enough; but you should not cut any of the original text and certainly not cut a character. Authors should do the writing and hire others to do the reading. The performance is fine, but the omissions kill me. Still worth the $5 if it isn't your only experience with Gilgamesh. great adaptation of a legendary tale. this was a great adaptation of this epic in everyday other than the recording of it. the narrator himself performs fine the recording is terrible. it seems like it is recorded low but with the treble cranked up high. so it hurts you head if you turn the volume up. I have never heard the story of Gilgamesh before. I really enjoyed listening to it. Naration on this book is so monotone, I just could not continue listening to it. Would you listen to The Epic of Gilgamesh again? Why? If you want to experience the Epic of Gilgamesh as it was probably experienced (and no doubt LISTENED to) by its early contemporary audience, I would try this reasonably priced version. The epic was no doubt originally a story meant to be told by a story teller just as the Gospel was originally delivered to the earliest of Christians. I thought this piece of performance art was well delivered by the man who actually performs it. Yes, in this case you want the piece performed by the person who wrote it. In no way did he either sound like William Shatner or William Shatner playing Captain Kirk, who I don't recall had an English accent nor did he deliver his lines in the manner of a story teller utilizing the cadence of blank verse. For once I could remember the Epic from beginning to end instead of scratching my head trying to remember what I had read a few pages ago. The piece itself is faithful to the story and the delivery was poetic in the way a bard might have presented his version of an ancient epic to a live audience in a language that had not been dead for thousands of years. One further note, it's always great when a male performer doesn't use a falsetto when delivering words spoken by a female character especially when the character was not a human.